Rincón de Guayabitos-La Peñita de Jaltemba-Los Ayala 3-in-1! These picturesque towns have plenty of accommodations to offer and lots of family-oriented recreational activities. You can sight whales right from the beaches and they’re the closest spots in the Riviera Nayarit to the Isla del Coral. 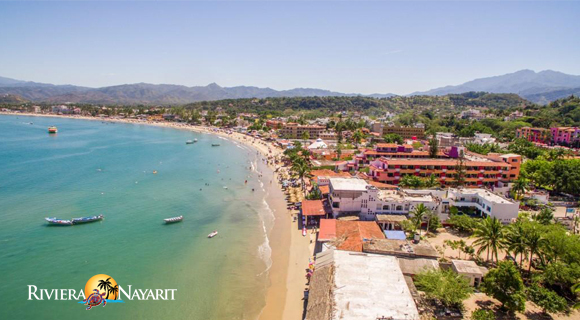 Guayabitos is the midpoint of these three seaside villages and the center of most of the activity. Take a tour on a glass-bottomed boat to peek at the marine ecosystem without getting your feet wet or, if you’re looking for a fiesta, take one of the party boats out of Guayabitos and Los Ayala. Looking for some water action? Jump aboard a banana or a jet ski! And if mountains are what move you, consider a fun ATV tour or exploring on horseback. Check out the El Naranjo Turtle Camp, located on a virgin beach with all the necessary services for a family camp-out—it’s a real treat to be able to experience sea turtles’ rituals in person! You’ll also want to visit Xaltemba Restaurante Galería, where art, food and spirits mix with culture and relaxation. In the mornings, coffee and a good read are available at Café Peñita de Occidente. This is the perfect beach to bring the kids and have them float around on the gentle waves. And if it gets too hot, you can always cool off with a Piña Loca (Crazy Pineapple) and its fruity goodness! On land, walk along the hillside to get to Frideritas and frideritas—two great little beaches, or head back to the water for a boat ride to Playa El Toro, where the rainwater forms a waterfall during rainy season. Monteón is just a few minutes due south of Los Ayala, where you can practice your swing on the 9-hole Ensueño Golf Course. And the Altavista archaeological zone is just a few minutes due north of La Peñita, with very cool petroglyphs and thermal springs to explore.